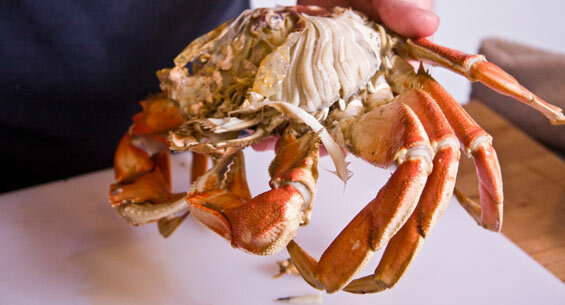 Cleaning a cooked Dungeness crab is a little messy, but easy once you know what to do. If you’re cleaning the crab for people to crack at the table (as we are demonstrating here) you really only need your hands and a little water. We recommend doing it in the sink. 1. Flip the crab over on its back. Find the wedge-shaped “apron” on the back end of its stomach. 2. Use your finger nails to pry up and remove the apron. This will expose the inside of the carapace, and you can use the gap to pry the top of the crab’s body off completely. 3. Flip it over and pry off the top shell. 4. In the exposed inner cavity, you should see some green goo (brains) and off-gray spongy gills. Pull out the gills with your fingers, and wash out the brains (you may have to use your fingers to make sure they all come out). 5. Hold either side of the body with your hands, with your thumbs in the cavity. Press down with your thumbs and pull up with your hands, cracking the body in half. 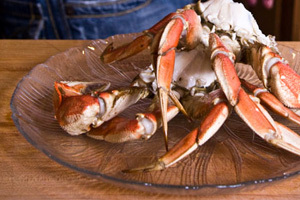 Each half crab (with its body meat and leg meat) will provide a single serving. 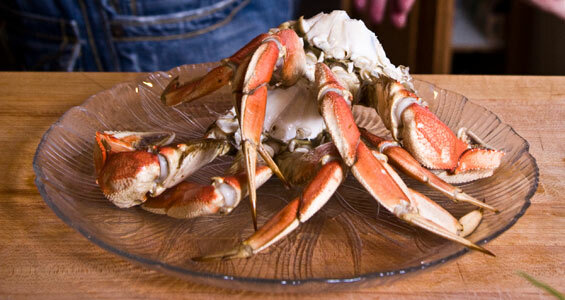 Serve to your guests with crab crackers and small forks so they can get the meat out of the legs. The traditional condiment of choice is simply melted butter in a little side dish for dipping.